Sakai Community DocumentationSakai 19 User Guide (English) StatisticsHow do I export a report? 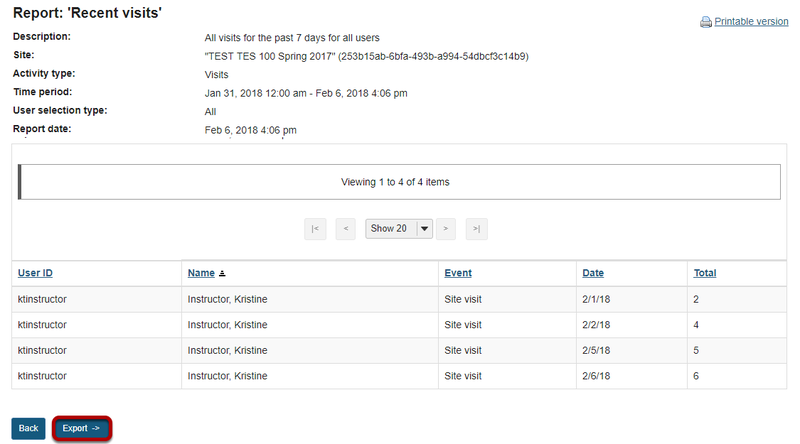 Select to view a report either by creating/running a report, or by clicking on one of the report links from the Overview page. Select the desired file format for your report to download the file. Export XLS will export the report to a Microsoft Excel file. Export CSV will export the report to a Comma Separated Values file. Export PDF will export the report to a Portable Document Format file. Prev: How do I print a report? Next: How do I modify preferences in the Statistics tool?